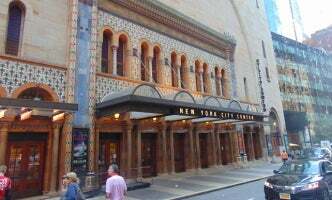 New York City Center was officially opened by Mayor Fiorello LaGuardia in December 1943 as Manhattan’s first performing arts center. It was designed by architect Harry P. Knowles and built by Clinton & Russell in 1923 for the Shriners under the name of The Mecca Temple. However, after the financial crash of 1929, the building became city property after the Shriners were unable to keep up with tax payments. The decision to convert the temple into a performing arts center was made by the mayor and the New York City Council President Newbold Morris, after the property had been slated for demolition in the early 1940s. In addition to the 2,557-seat main stage, the facility also houses two smaller theatres and four studios. Since its launch, New York City Center has become one of the city’s prime venues for dance. It is also home to the Manhattan Theatre Club’s off-Broadway productions since 1984 and has garnered great critical acclaim for its annual Encores! productions since 1994 (which re-imagine great American musicals in concert or semi-staged incarnations), even receiving a Tony Award for Excellence in Theatre in 2000. Encores! Off-Center series was also launched in 2013 to present seminal off-Broadway musicals in a similar fashion.